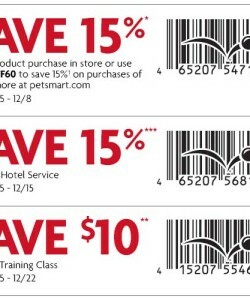 Save tons of money with this PetSmart Coupon today. 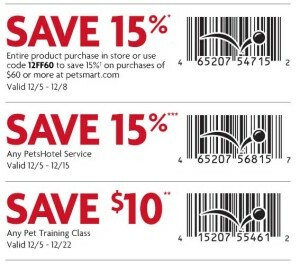 Save 15% Percent off entire product purchase in store or use the PetSmart Coupon Code 12FF60 to save 15% on purchases of $60 or more at Petsmart.com. This offer follows the famous Black Friday and Cyber Monday deals to continue with the Holiday spirit and encourage shopping at their PetSmart Stores. Imagine buying absolutely anything at PetSmart and saving 15% off. This is a must have coupon and coupon code for both online and in store. You could use it on anything. Most commonly, quality pet food. You could stock up on some Blue Dog Food for the coming months! Also, consider the amazing Savings of 15% Percent off of any PetsHotel Service! It’s the holiday season and the PetSmart PetsHotel is essential for when you need to fly to visit family. Why not use the PetsHotel from PetSmart, a company you trust and Save 15% Percent in the process with this PetSmart PetsHotel Coupon! 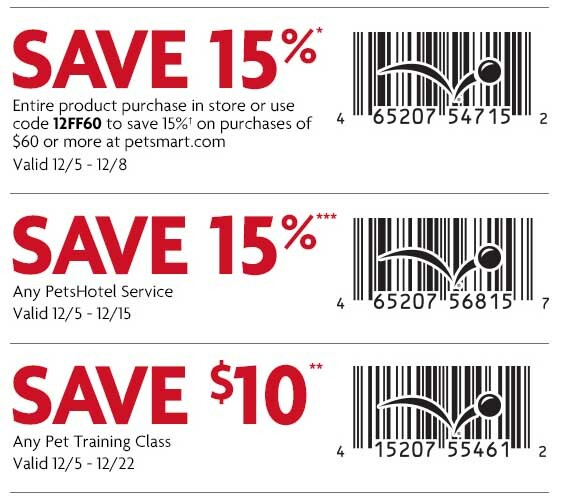 And finally, if you find yourself with a slightly unmanageable dog (maybe due to overfeeding this Thanksgiving), you can always save $10 off your Training session with this PetSmart Pet Training Class Coupon! Saves you $10 cash, straight up. Use the coupons either in Store or online. If you want to use it in-store, simply print it out or save it on your mobile phone to show the cashier. Treat your pet and enjoy savings this holiday season!